SIGMA SPORT offers superb German tech for bicycles all over the world. Although quality is one of the company’s most important focuses, they also guarantee fair prices. SIGMA is a leader in the field of wireless bike lights and cycle computers. The products are developed and produced in Neustadt an der Weinstraße, with additional locations in the USA and China. In order to realise their stringent goals of excellent quality production, all products are extensively tested before they leave the production halls. Sigma Sport is a German company that injects innovation into every product it manufactures. Striking the balance between key factors such as price and performance, its design-savvy bike products perform exceptionally well under even the harshest conditions. Suited to cyclists of all levels, Sigma Sport’s extensive collection will revolutionise your ride with its collection of high tech gadgets that include pulse monitors, bicycle computers, bike lights and other nifty gadgets. From pioneering the first bike computer over three decades ago, to developing innovative bike accessories such as wireless transmission systems, Bluetooth low-energy heart monitors, activity trackers and sports watches, Sigma Sport represents the best of German innovation. Sigma Sport products combine precision engineering with intelligent innovation. Each product is developed and tested at the company’s in-house laboratories in Germany and must adhere to the most stringent of inspections to ensure that they meet the demands of even the most challenging conditions and environments. All products are CE-approved and no product is shipped until it has passed rigorous quality controls. 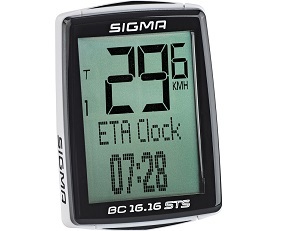 On the Bikester.co.uk website you can find a comprehensive selection of Sigma Sport products including the popular Sigma bike computer as well as headlamps, bike lights, watches, activity monitors and other accessories. Sigma Sport is well known for its high-performance range of cycle computers, which measure and record essential data such as speed, heart rate, temperature, power, times and distances. In addition, it can log your heart rate function and how many calories you’ve burned. The Sigma bike computer features a large display and sporty look and is ideal for cyclists of all levels. The computer has a built-in stopwatch for interval training. Furthermore, it can be used without a bike, such as while walking or running, so you can keep an eye on your vitals during exercise or activity of any kind. Sigma high-tech heart rate monitors help the user to keep track of the heart and respiration during activities such as cycling, walking or jumping. With their advanced technology, the monitors help athletes to maintain the right level of training. Basic functions include heart rate monitor, calorie counter and timer, as well as the ability to measure distance and speed. The Sigma heart rate monitor is available in a variety of colours and design options and is built to withstand the harshest of conditions. Sigma Sport also developed bike lights with premium LED technology. With Sigma lighting you can feel confident riding in the dark, whether off road or in a busy city. Sigma lighting is available for both the front and back of your bike and the batteries are made to last an exceptionally long time.